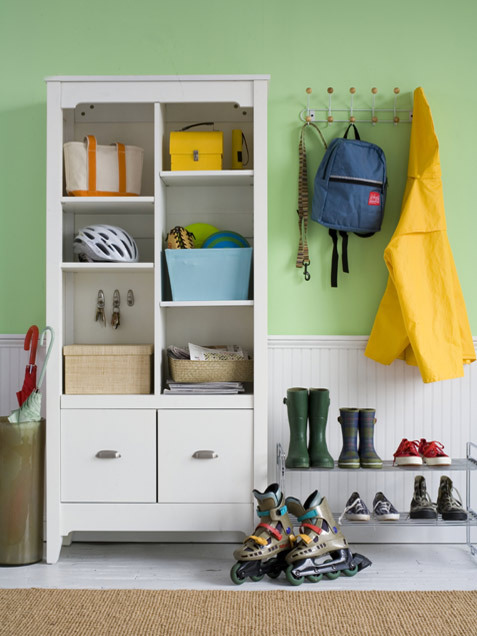 Your home can be organized but still look nice! Baskets, wood drawers, wire baskets, bins and boxes can be used to organize anything in your home and at the same time add fun decor to the look of the rooms. See if any of these ideas below can be incorporated into your home. There's always some kind of room under the bed. 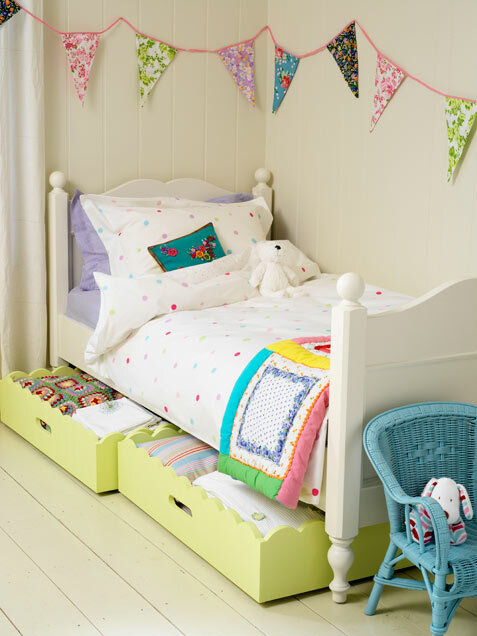 There are five baskets under this bed, that's a lot of storage. Could be clothing, toys or books. Add a small hang tag to the baskets so you know exactly what's in each one. These drawers could be easily built. I love the scallops, it adds so much to the look. Then paint them the most fabulous color there is and you're organized in style! Let's use the wall space now. 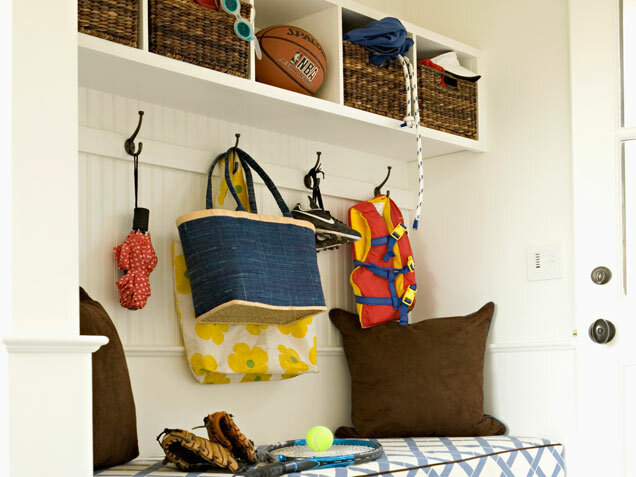 It's perfect for some wall mounted cubbies-Use baskets or bins here. The bins come in all kinds of colors so there's sure to be one that will match your decor. A strip with hooks on is another excellent idea--A place for everything. A large coffee table with cubbies makes for a perfect side table and a place to stash trinkets and toys. Convert a thrift shop or garage sale coffee table into a storage unit by adding a shelf and dividers. Then paint your favorite color. Everyone could use a small library in their room. This one is perfect at the foot of the bed and is only as wide as the bed so not to take up much room. Perfect! A long pegboard makes organization look great. 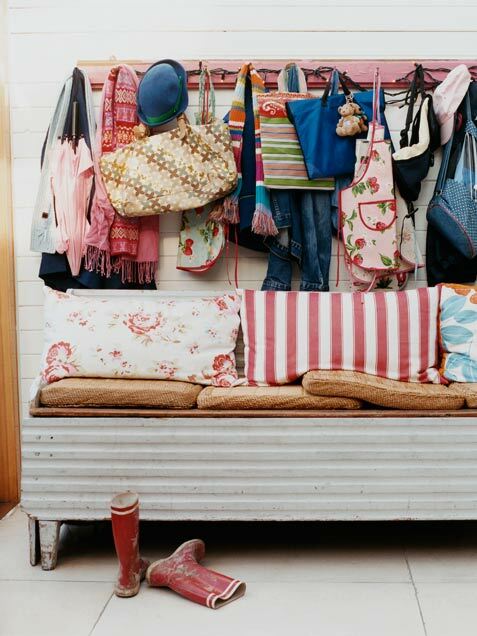 At your entryway or mud room it is perfect for coats, purses, backpacks...remember, a place for everything. The bench is both seating and storage. You've just doubled your storage is this small area! For the best use of space in a narrow room, install captain beds with underneath storage and arrange them head-to-head along one wall. Look at all that storage! 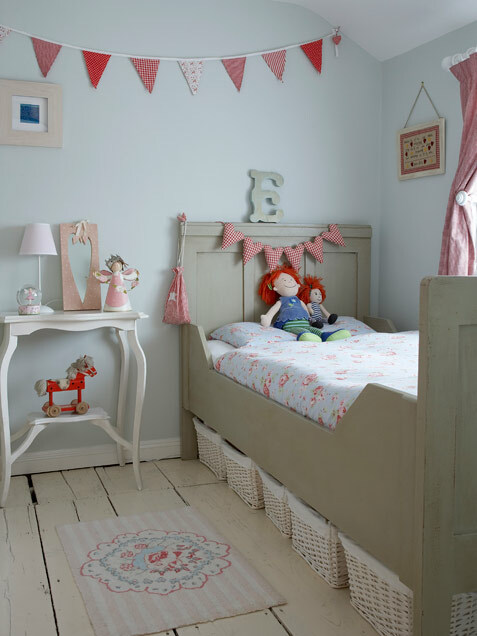 And for the grown-up bedroom...The bins look great under this bed too. However you do it....you can add extra storage to your home in style. 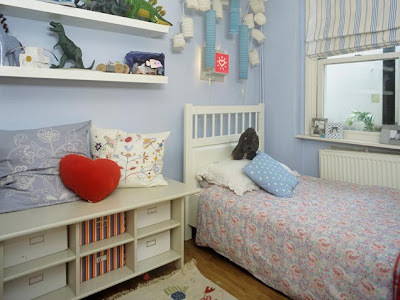 You can find all these ideas plus a lot of other great storage suggestions on the iVillage Web Site With 52 different storage/organizational ideas, you're sure to find something to solve your storage problem.